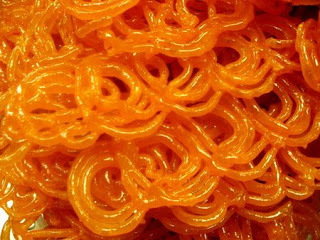 A jalebi is the perfect anytime of the year treat! Sinfully sweet, deep fried, soaked in sugar syrup, what could be a diabetic's bigger enemy? And a diabetic's ultimate fantasy? Perfecting the art of making a jalebi is not for the weak hearted. You not only have to get the dough right, you have to also learn how to get the shape right. It is very difficult to put the dough round and round in hot oil without spoiling the shape. I have been a big jalebi fan since childhood. Jalebi with fafda and fried green chillis was on the breakfast table atleast once in two weeks. Fafda is deep fried, long, wide streaks of gram flour (besan). The combination of jalebi, fafda and green chillies can be quite addictive. Sweet for breakfast, you might wonder? Well, we Gujjus can have sweet all the time! But try this combination and you'll thank me for life. The jalebi must be distinguished from its cousins the imarti and the jahangiri. These are also sweet and similar in shape - concentric circles, sort of. But one bite and you can tell the difference. while the jalebi is usually smooth in texture, the other two are more rough. Kesar (saffron) accentuates the flavor of a jalebi manifold. In Hyderabad, the Agrawala stall in the Annual Industrial Exhibition from Jan 1st to Feb end makes great jalebis. The sweet shop, Makhan Bhog in Prenderghast Road in Secunderabad makes excellent kesar jalebis on Sunday mornings only. I was told recently that there is a bandi near the Mahankali Temple in Secunderabad that also makes great kesar jalebis. I must try them out one of these days. have u tried Paneer Jelibi? Its a bit heavy as compared to the normal jelibi. the difference its soft, tender (as in a jamun). wheres a jelibi is a bit crispy. hot jelibis on a rainy day. if this isnt heaven, what is? No S, I haven't tried the Paneer Jalebi. Could you please recommend a place that makes it? Got the location wrong. sorry. its Balaji Sweet Shop @Kacheguda n quite famous too.